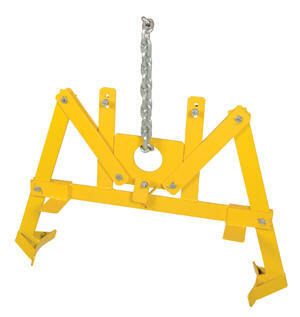 The Vertical Drum Lifter provides for easy lifting and transporting of drums. Solid steel construction. 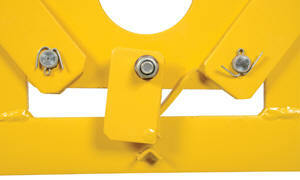 To use, simply lower unit onto the drum and as the lifter is elevated the positive gripping pads secure the drum. When the drum is lowered to the ground, the carriage drops down, automatically locking the drum lifter in an open position, ready for another drum. Use on 55 gallon steel drums with a top lip or chime. Not for use with open head drums.